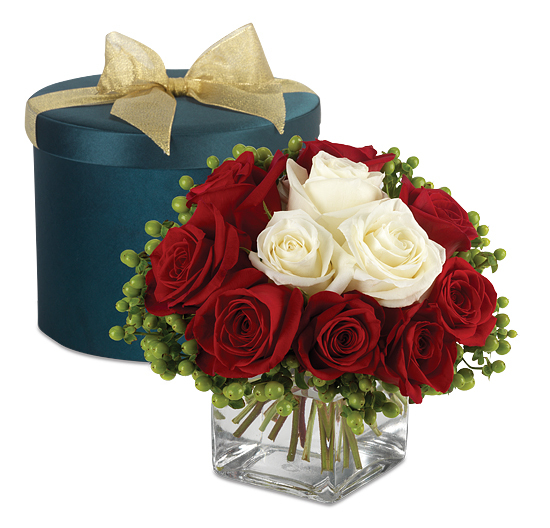 We are currently offering our Luxury Roses & Berries Hatbox Bouquet without our signature green satin hatbox. Presentation isn’t everything; but it goes a long way to make someone feel special. With a touch of European flair, snow white Blizzard roses are encircled by ruby red Freedom roses mixed with clusters of green hypericum berries to create a full display in a modern clear glass vase. The bouquet arrives perfectly arranged in our garden green satin hatbox tied with a metallic gold bow. Remove the bouquet immediately upon arrival by pulling up on the handles of the insert. Gently lift bouquet from the slotted center. Fill vase ¾ full with warm water and add the floral preservative. Remove the hydration foam from the stems; the foam is a bio-degradable material and can be discarded safely. Trim ½” from bottom of bouquet while holding stems under water, and place immediately in vase. Keep arrangement away from drafts, direct sunlight and excessive heat or cold. Change water and recut stems every 2-3 days.